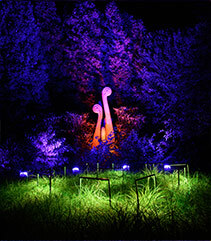 GLEAM, Art in a New Light, is an annual exhibit featuring local, national and international artists creating light-based installations throughout Olbrich's 16-acre outdoor gardens and the tropical Bolz Conservatory. Visitors wind their way through dimly lit pathways, encountering strange and surprising forms that pulse and shimmer in the night around every corner. Interested in submitting a light installation proposal for Olbrich's 2019 GLEAM exhibit? All questions can be directed to Aaron Wilkie at awilkie@cityofmadison.com / 608-245-3687. "Thanks. Nice evening in the Gardens - love the artistic ambience"
Interested in supporting this exciting, public art exhibit? Contact Special Projects Manager, Missy Jeanne, to learn more about the great benefits and recognition opportunities GLEAM sponsors receive! For an overview of previous exhibits, check out the installation images below! Jeff Epping has been Director of Horticulture at Olbrich Botanical Gardens for more than 20 years. He oversees the horticultural operations and garden designs of more than ten inspirational display gardens, showcasing the best plants for south-central Wisconsin. A graduate of the University of Wisconsin-Madison, Jeff holds a bachelor’s and master’s degree in Ornamental Horticulture. He worked at the Chicago Botanic Garden before joining the staff at Olbrich and has visited, studied and photographed gardens throughout the U.S., U.K., Netherlands, South of France and Thailand. Olbrich partners with Reinders Inc., a local company that carries one of the largest inventories of professional landscape lighting products in the Midwest. Paul Hayden serves as Lead Lighting Designer for the exhibit, overseeing the lighting component of each installation, and assisting in the procurement of lighting supplies. Reinders works with the very best manufacturers in the industry and currently uses Olbrich Gardens as a test and training site for area lighting designers during the peak growing season.